"Wonderful, sweet rum-based beverage with Blue Curacao and Midori Melon." Fill a large glass with ice. 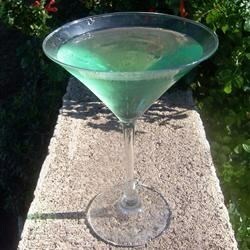 Pour in the rum, blue curacao, melon liqueur, sweet and sour mix, and apple juice. Stir to combine. Delicious! The balance of sweet and sour with the melon and blue curacao is fantastic. pretty tasty. great evening cocktail.